First of the first of the first. 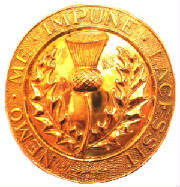 The Royal Scots are the oldest, and therefore most senior, infantry regiment of the line in the British Army, having been raised in 1633 during the reign of Charles I of England. During service in France in the 1630s the Royal Scots earned the nickname “Pontius Pilate’s Bodyguards.” The French Regiment of Picardy asserted that their regiment was the older regiment, having been on guard at the Crucifixion. The Royal Scots claimed they were there too, as bodyguards to the governor! The First Battalion of the Royal Scots sailed from the West Indies to Canada in the summer of 1812 and landed at Quebec City. Because of the years spent in service in the Islands nearly everyone was suffering from one sort of sickness or malady to the extent that the Regiment was unfit for duty until the following January. 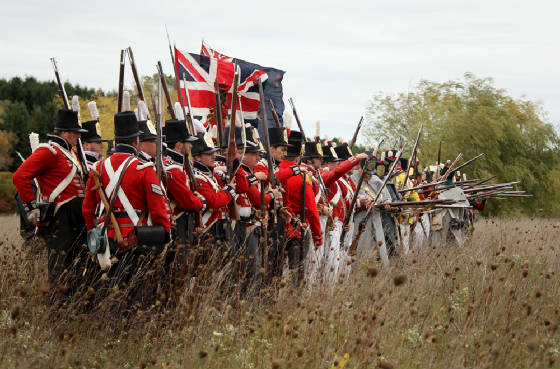 The Royal Scots 1st Battalion was very active in Upper Canada in the War of 1812, being present in eight major engagements and many minor skirmishes against the forces of the United States. These included Sackett’s Harbour, the capture of Fort Niagara and the burning of Buffalo in 1813, and the Battles of Longwoods, Chippewa, Lundy’s Lane, and Fort Erie in 1814. 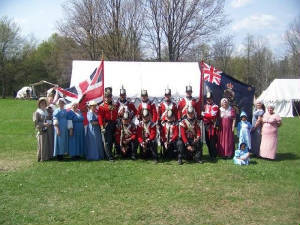 The campaign in Upper Canada earned the battle honour “Niagara” which is displayed on the Regiments colours. The 1812 Royal Scots Grenadiers are a recreated re-enactment unit of the War of 1812 created by the Upper Canada Military Re-enactment Society. The Upper Canada Military Re-enactment Society's Royal Scots are based in south-western Ontario. 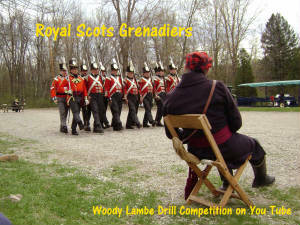 Members of the Royal Scots Grenadiers regularly participate in re-enactment events throughout Ontario, New York, Ohio, Michigan and Indiana and have appeared in historical movies and television programs. To see where we might be next check out our Calendar of Events page. The group has many members from all walks of life and age groups with both single members and families. If you enjoy history, travel, camping and visiting interesting places and think you may be interested in re-enacting contact us today to join the 1st Regiment of Foot, the Royal Scots Grenadiers. Membership is available to all members of a family and there are many roles which can be portrayed. Take the King's Shilling and join today. We are a green hobby as we recycle more than just our soldiers. For more information, join us at an event to learn more. I Swear to be true to our Sovereign Lord King GEORGE, and to serve Him honestly and faithfully, in Defence of His Person, Crown, and Dignity, against all His Enemies or Opposers whatsoever: And to observe and obey His Majesty's Orders, and the Orders of the Generals and Officers set over me by His Majesty.